Birth injury lawyer Jeffrey Killino is recognized around the country for his dedication to holding the physicians, nurses, and other medical practitioners whose negligence or medical malpractice cause children’s birth injuries accountable through legal action. Whether childbirth injuries result from the negligence of doctors and other medical professionals during a woman’s pregnancy or the inadequacy of care during the labor and delivery stages of a child’s birth, Jeff Killino is ready to fight for justice from any and all those responsible for a child’s birth injury or death. In addition to seeking compensation from the physicians, nurses, midwives, and other medical personnel who negligently cause a child’s birth injury, attorney Killino aggressively pursues compensation from the hospital in which a birth-injured child is born and the employers of the medical professionals who negligently contribute to a child’s birth injury, as well. When defective labor assistance devices or other medical equipment are causal of a child’s birth injury, Jeff Killino goes after all those involved in the production of the defective equipment, its release to the market, and the hospital personnel responsible for the repair or replacement of defective medical equipment that has contributed to a child’s birth injury or death. Attorney Killino and his highly regarded team of birth injury lawyers and paralegals have tenaciously advocated across the country for the rights of children injured at birth. Their skill and expertise in all areas of childbirth injuries, their extensive knowledge of the medicine and law related to birth injury cases, and their tireless pursuit of justice for each and every one of their birth injury clients have earned them a reputation for going the extra mile and doing what it takes to obtain every bit of the compensation their clients deserve. They have achieved nationally recognized results in cases arising out of all types of birth injuries caused by medical malpractice, including Erb’s palsy and other brachial plexus palsy injuries; cerebral palsy (CP); hypoxic ischemic encephalopathy (HIE); labor and delivery errors; childbirth complication injuries; improperly performed Caesarean sections (C-sections) or the failure to order C-sections when indicated; asphyxia injuries; and many others. If your child has sustained a birth injury or died at birth as a result of medical negligence or defective medical equipment, Jeff Killino and his team of birth injury lawyers will fight for the compensation to which you and your family are entitled. Birth injuries are one of the most tragic experiences a child and child’s family may ever face. The consequences can be severe and debilitating, requiring permanent care and an upheaval of the life a family dreamed of but will never attain. No amount of money can replace the life and happiness a child has lost as a result of someone’s negligence. But, the financial awards achieved through legal action against the parties responsible for children’s birth injuries can help defray the nearly insurmountable medical and other costs some families are forced to endure. 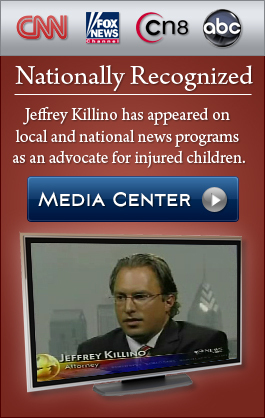 Jeff Killino and his dedicated team of birth injury lawyers are ready to fight for you.